Best Collections of Free and Premium Celebrity WordPress Themes. Bonita Responsive WordPress Theme is a fashion photography theme, for people who likes beauty and put all inspiration photos on personal WebSite or for professional photographers. With Bonita Theme you can create a realy beautifull site. You can make a lot of sliders, galleries, video blogs, press posts. You have five different post types for: Gallery, Models, Diaries and Press. Seduction Magazine is a glamorous theme designed for gossip, celebrity, fashion and fan clubs websites but can be easily adapted for any style. The theme is built on top of the flexible Gorilla Themes widgetized framework where you can drag-drop-edit any widgets from the left and right sidebar and setup the layout in one click. CelebrityGossip is a WordPress theme for Entertainment websites, Gossip blogs & Celebrity News sites. Every element of this theme is well crafted and makes your site look professional website and you get maximum exposure to your content. CelebrityGossip theme has all the things that a successful entertainment website needs. Celebizz is your perfect WordPress theme solution to build celebrity news site or other content-rich sites. Celebizz comes with 3 widget areas (Sidebar Left, Sidebar Right and Homepage) and other useful features to help you build top notch celebrity news site! CelebrityPress is the ultimate WordPress Magazine Celebrity Theme. The theme feature 2 dynamic menus and multiple sidebars customizable within the admin with dropdowns categories and custom links, 6 color styles and a layout selector to use the theme in traditional Blog style or the popular Magazine style. We have one of the best celebrity themes for WordPress, and eCelebrity is a prime example of it. This theme has an option to change just about anything on the website, from the number of menus to the “read more” tags on your posts. Celebrity Gossip features a unique photo gallery layout for the homepage, category/tag/monthly archives and search results etc. This theme also saves you the hassle of generating thumbnails and keying in custom fields. Celebrity Fansite is a Free Celebrity WordPress Theme. 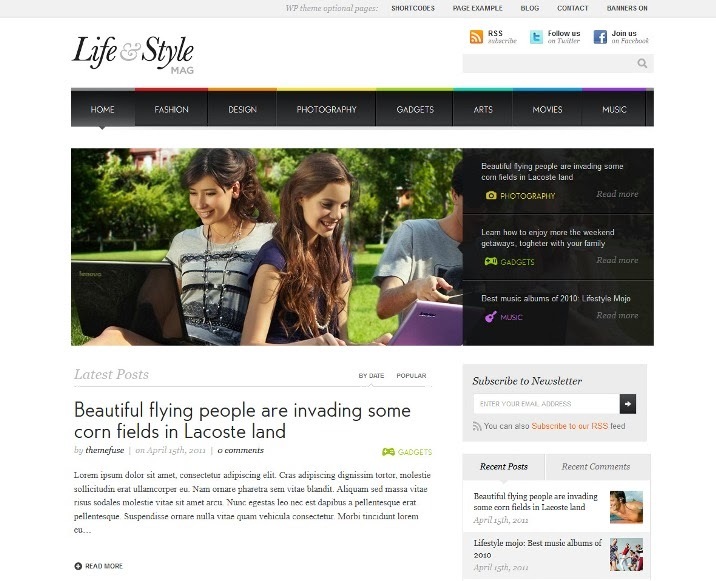 Fashion Pro is a Colorful and eye-catching design, suitable for fashion and celebrity blogs.